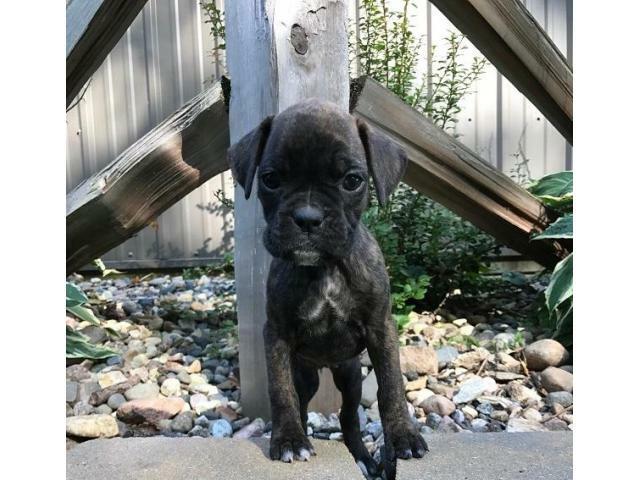 AKC Boxer Puppies - 1 Females Available Browerville - Lotsofpups: Find & Adopt a Dog Today. 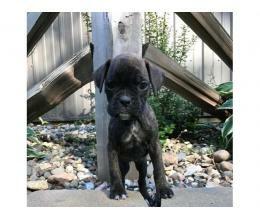 We had a litter between Breezy Boxers dam - Shanghai, and Breezy Boxers Sire - Dakar. The puppies were born on July 20th, 2017. We have 1 female still available. They will be ready to go home on Sept. 16th, 2017. You can check out our website: www.breezyboxers.com for more pictures of all the puppies and information on our breeding program, and contact info. Shanghai is a Reverse Brindle and Dakar is a deep Mahogany Fawn. The puppies are born in our home and kept in the home for the first 4 weeks then moved to a heated shop to the puppy housing area. The puppies have tails docked and dewclaws done at 2 days old. They are given their first puppy vaccination and checked over by our vet at 6 weeks. They are weighed 2x a day until they reach 4 weeks of age to ensure healthy weight gain and that they are thriving. They are wormed 2-3 times before they leave at 8 weeks of age. The puppies are played with and handled daily. We are small time breeders and only have 1 male and 2 females (1 retired male) that all live and socialize in our home with us. We only have puppies about 1x a year. We strive to breeding for personality, conformation, and coloring.